Legends of cricket, Sachin Tendulkar and Brian Lara met each other on the sidelines of an event. Both Tendulkar and Lara are involved in the ongoing Indian Premier League 2019 (IPL 2019). While Tendulkar is the mentor of Mumbai Indians (MI) team, Lara is working as an expert with the official broadcaster of the IPL 2019. Global Sports Fan Awards for Iconic Sachin Tendulkar’s Worshiper Sudhir Kumar Gautam. Tendulkar took to Twitter and uploaded the picture of his meeting with the former West Indies cricketer. 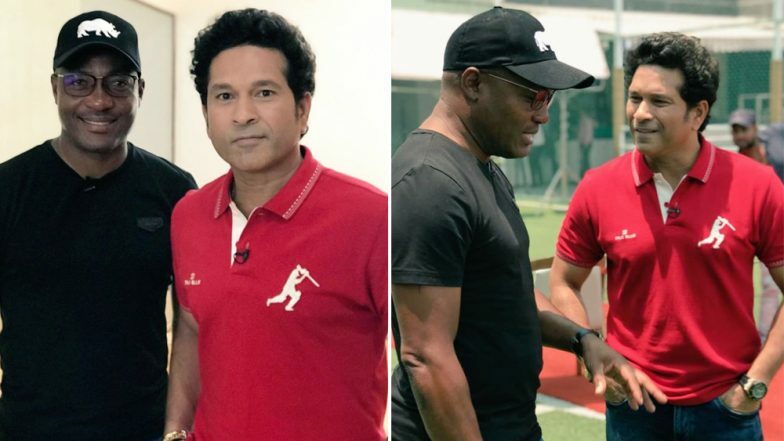 “It's always fun to catch up with @BrianLara and discuss cricket, golf and more!” wrote Tendulkar along with the pictures. Both Tendulkar and Lara hold a plethora of batting records and were considered fiercest rivals during their playing days. Interestingly, last year during India vs West Indies series, the two legendary cricketers met and it was golf that united the former greats. Brian Lara to Make Commentary Debut in VIVO IPL 2019. While Tendulkar has 34357 international runs including 100 international centuries, Lara has 22358 international runs including the highest individual Test score of 400 not out against his name. When it comes to batting, youngsters often look up to Tendulkar and Lara. With two greats of the game coming together, Tendulkar’s post was bound to go viral. AT the time of filling this story, his post on Twitter had over 500 retweets and over 5000 likes.